Levi Leipheimer accepting cheers after winning last year’s inaugural race. 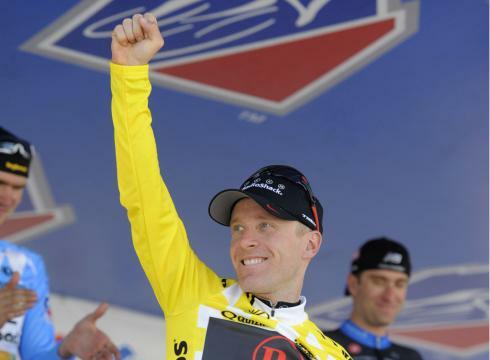 Levi Leipheimer will defend his title in August at the USA Pro Cycling Challenge and 2011 Tour de France champion Cadel Evans will return for his second shot at the Colorado race. Race CEO Shawn Hunter announced those participants on July 10, as well as the top teams participating, including the likes of BMC, Radio Shack, Garmin and Astana. See all the teams on the race’s official website here and learn what other top riders now in the Tour de France might compete as well in this Denver Post story. This year’s race will start Aug. 20 in Durango and finish with a time trial on Aug. 26 in Denver. See the entire route. Race organizers, aiming to correct a big gap in last year’s TV coverage when viewers were left in the dark, have created a plan to ensure coverage of the thrilling downhill on Independendence Pass into Aspen. Read how. Last year’s inaugural USA Pro Cycling Challenge was a huge success, with more than a million people coming out to attend the return of professional bicycling to Colorado. Levi Leipheimer won the closely-contested race over Christian VandeVelde and Tejay van Garderen. Other superstars like Andy Schleck and brother Frank also came to Colorado.